I watched an episode of TLC’s “Rides” tv show that profiled the build up of Rhys Millen’s factory backed Pontiac GTO “drift car” and I thought the car and the concept of drifting was pretty cool. If you have not heard of it before, Drifting is a sport that is popular with the import crowd and was started in Japan. Within the past few years Drifting has made it across to the U.S. and has gotten a lot of exposure. The Formula Drift series became official in 2004 and while most of the cars to compete in the first season were import brands there were two American factory backed efforts. One of those being Pontiac who hired New Zealand rally ace Rhys Millen to build and drive a new GTO. Basically, the idea behind the sport is for the driver to hang out the tail of the car and drive it sideways for as long as possible coming within inches of barriers or other competitors without hitting anything. It’s the automotive equivalent to figure skating. It might sound a little hokey but it’s actually pretty cool to watch. Lot’s of tire smoke and close calls. Living in the midwest I know first hand how much fun it is to “drift” cars. Of course, we just call it driving in the snow. Recently, Polar Lights came out with a kit of Millen’s car and I decided to add it to my collection. 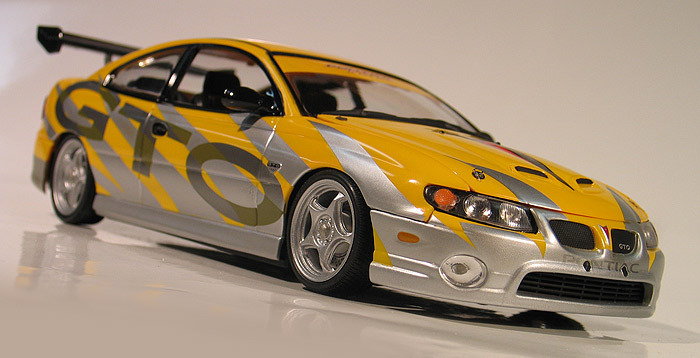 The kit comes with a pre-painted body and is available in both the 2004 yellow/silver and 2005 yellow/blue paint schemes. I liked the 2004 car better so I went with that one. 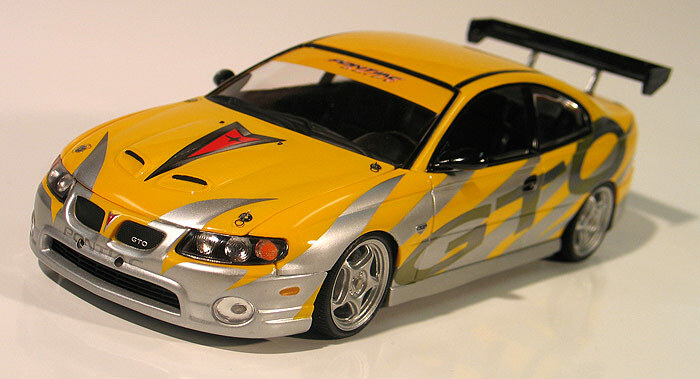 Although the kit is nicely done, aside from the paint it really represents a stock GTO and not an accurate drift car. The real car has a different body kit, hood, wheels, tires and rear wing then those included in the kit. Also the real car has a gutted interior while the kit has a full stock interior. Because the kit was already pre-painted I decide to keep this a real simple build and just try to focus on a few things to make my model look more realistic if not quite accurate. The finish on the body was pretty well done on my example so I decided to just detail paint some of the trim and then polish it out. The headlights though were another matter. Out of the box they look pretty toy like as there is no detail behind the lenses. Using a dremel tool, I ground out headlight buckets, covered them with foil and painted the surrounds black. For wheels and tires I used the optional set found in Revell’s Mitsubishi Eclipse kit as they are very close to the ones on the real car. I also added crossed drilled Brembo brakes that I cast in resin from another kit. The suspension was also modified so the model would sit with the proper lowered height. Also, I thought the struts from the kit that held the rear wing were pretty lame, so I laser cut a new set from sheet styrene. Lastly, I added a set of exhaust tips that I made from aluminum tubing and added photo-etched hood pins to the hood and deck lid. All in all, a pretty satisfying build with just a few evenings worth of effort.